Destined for launch in 2014 on the Chevrolet Impala, MyLink - executed on a seven-inch screen - is a relatively simple user interface that apes that of a smartphone. It's an in-car infotainment system built around a connected radio, with icons for Audio, Phone, Nav, Pandora internet radio, OnStar and Weather. It feeds entirely off a linked smartphone or iPod touch, from which it can stream music, access contacts and fetch GPS navigation data. 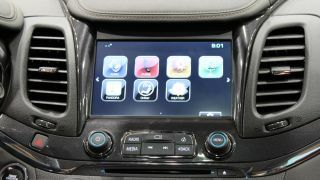 "The interface looks and feels like a traditional smartphone or iPad," David Szczepanski, lead connected customer specialist at General Motors, told TechRadar. "We did a lot of research and we decided that we didn't want to reinvent the way people interact with technology when they already have a way that's standard, and that they enjoy." At the top of the OS is an app tray for commonly used items that's similar to a dock you would see on a Mac or an iPhone. "The real heart of this is the way it's interconnected with all the systems and features of a smartphone," explains Szczepanski. "If you link an iPhone via Bluetooth you can download all of your contacts into the system for using in your in the vehicle." Hands-free calling is made even more hassle-free by the addition of a more natural voice recognition unit that's both more accurate and less robotic when it responds. "So now the phone is delivering some information to the infotainment system it can do a few things with it," says Szczepanski. On the Chevrolet MyLink OS is a little area called favourites - a common sight on in-car radios - but here it does more than just store favourite radio stations. "I can save favourite destinations that I go to frequently, a phone number, or even multiple phone numbers, for a particular person, but one of my favourite features is how OnStar is built into here," says Szczepanski. The OnStar RemoteLink app, available for iOS and Android devices, is a subscription-only telematics platform that forms the backbone of MyLink - and it's packed full of the latest convenience features. "I can start the Impala from down the street by entering my code into the app, or find it in a parking lot by starting the warning lights," says Szczepanski of OnStar, though the star-turn here is undoubtedly the navigational convenience. "I can find a destination on my phone and send it to the car. When I get in my car and switch on the engine it will ask if I want to go to whatever destination I've sent to it, then I can have it speak to me, for in-dash nav." Szczepanski then used the app to log into his own car in Chicago, check the oil, fuel mileage, tyre pressure and the locking system. Clever stuff, but the chance to fiddle with a sat nav on a phone rather than while in the driving seat? Genius.